The Way of Peace Fellowship is the clearest embodiment of our center’s commitment to inter-religious dialogue. The John Main Center is proud to sponsor a fellowship group each semester in which students reflect and comment thoughtfully and respectfully on texts from a tradition not their own, in the presence — and with the reciprocal participation — of other students from the tradition for whom these texts are sacred or normative. Although faculty experts on the traditions involved are present in the room to answer questions and to witness the proceedings, the entire event is self-managed by the students. Each semester’s fellowship group takes part in a culminating event in which they can share their conclusions and questions about religion and spirituality with prominent religious leaders and scholars. Recent Way of Peace Fellowships have treated well-known texts such as the Muslim Fatiha and the Christian Lord’s Prayer; the Buddhist Heart Sutra and the passage in the Gospel according to St. John (13:1-17) in which Jesus washes the feet of his disciples; as well as texts from the Jewish Kabbalah. In 1994, His Holiness Tenzin Gyatso, the 14th Dalai Lama, delivered the tenth annual John Main Seminar in London at the invitation of Benedictine monk Laurence Freeman OSB, director of the then newly-formed WCCM. As part of the format of that dialogue, Fr. 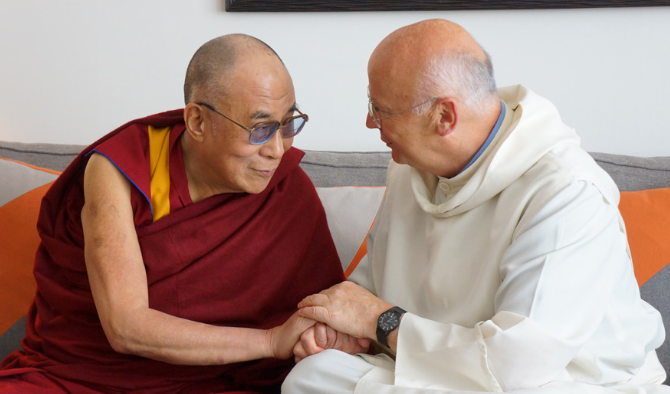 Laurence suggested that the Dalai Lama respond from a Buddhist perspective to passages from the Christian Gospels. This was thought to be the first time the leader of a major religious community commented so publicly and in detail on the sacred texts of another religious tradition. This form of commentary opened a new way of dialogue among religions, wisdom traditions, and secular seekers by using sacred texts or documents as the grounding to find common respect, reverence, humility, humor, and a spirit of friendship. The results of this John Main Seminar were so well received that the entire proceedings were subsequently made available in a series of tapes called The Good Heart Dialogues. Shortly thereafter a book appeared, The Good Heart: A Buddhist Perspective on the Teachings of Jesus, issued by Wisdom Publications (Boston, 1996), with further elaborations by the Dalai Lama on the approach used at the seminar. The John Main Center has institutionalized this model, creating a space for students to share texts which are sacred to them in a spirit of understanding and mutual respect. Below you can watch the Second Way of Peace Fellowship which took place at Georgetown University on 18 April 2017, with students and three teachers from different traditions: Brahmachari Vrajvihari Sharan (Director of Hindu Life at Georgetown University), Geshe Dadul Namgyal (co-founder and Director of the Emory-Tibet Partnership), and Fr. Laurence Freeman OSB (Director of The World Community for Christian Meditation). Sean Hagan (member of the Executive Committee of WCCM) served as the moderator. The John Main Center is currently accepting applicants for the Way of Peace Fellowship. Applicants must be enrolled at Georgetown University at the undergraduate or graduate level, or otherwise affiliated with the John Main Center. If you have questions about the Fellowship or are interested in applying, please contact Tony Mazurkiewicz (tm1304@georgetown.edu). Get text updates of our regular activities and group events. Sign up by clicking the button below. For the John Main Center Campus Ministry website, click here. For the Georgetown University Campus Ministry homepage, click here. For the WCCM homepage, please visit www.wccm.org.